You may be asking, "What is a Flower CSA?" 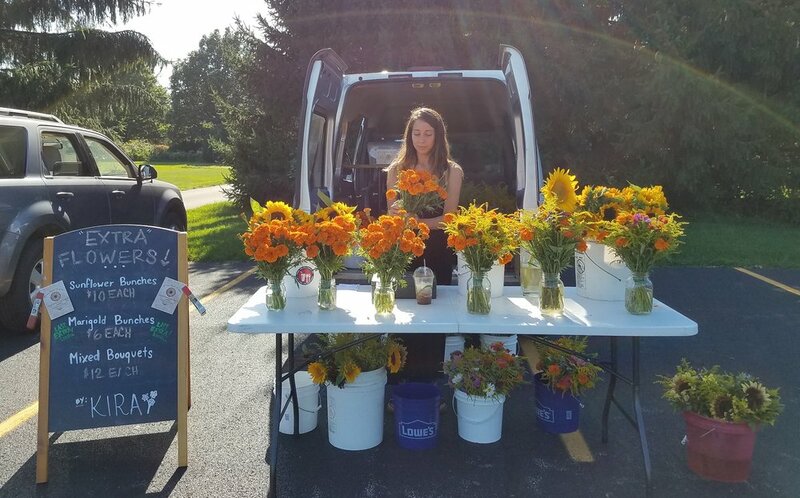 Well, Community Supported Agriculture (CSA) is a relationship between a community and a local farmer, often a fruit or vegetable farmer, but in this case a flower farmer. In this relationship, I provide you, the CSA subscriber, with a designed bouquet of seasonal blooms for each week of your subscription. 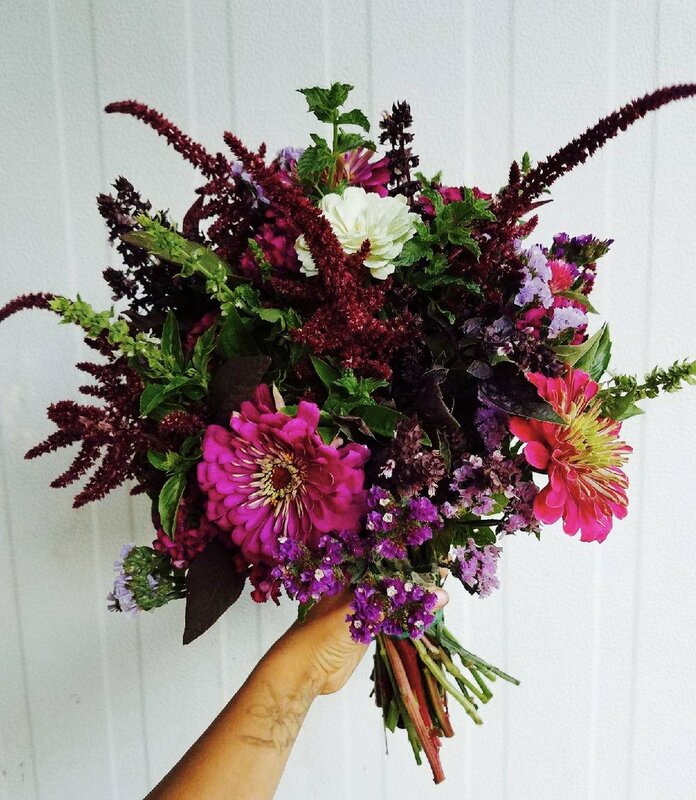 Like any subscription arrangement, you pay up front, and then I deliver your fresh, local, organic flowers to you each week for 25, 15, or 5 weeks. You may also give a gift subscription to a special someone, who will be reminded of your love week after week! By purchasing a membership in Kira's Flower CSA, you not only get fresh, beautiful flowers in your home each week, but you also become part of positive change within the flower industry, helping to protect the earth and all living things. Unitarian Church, 1613 E. Emerson 6:00-7:00 p.m. Address will be emailed 5-5:30 p.m.
Central Peoria (will message you the address when I notify you of the start date) 4:30-5:30 p.m.
Kira's Flowers, 3404 Springfield Road 4:30-6:30 p.m. Address and time will be emailed. Peoria Riverfront Market, Water St. 8-12 p.m.
2019 Full Season CSA- 22 weeks! Full Season Subscription: 22 weeks of bouquets from late April to mid October. It is designed for the true flower lover who wants to experience local flowers throughout the entire growing season. This CSA will begin with spring blooms like peonies, tulips, ranunculus, alliums and continue with the first of the summer annuals/perennials like snapdragons, yarrow, feverfew, and delphiniums. The rest of the season will be chock full of sunflowers, marigolds, zinnias, rudbeckia, cosmos, and so much more. Kira's Flower CSA- 12 weeks! Partial Season Subscription: 12 weeks of bouquets. This CSA will run from mid June to mid October when armfuls and armfuls of the season’s best flowers are being harvested from the field. These months are perfect for experiencing all the beauty that can be grown right here in Illinois. 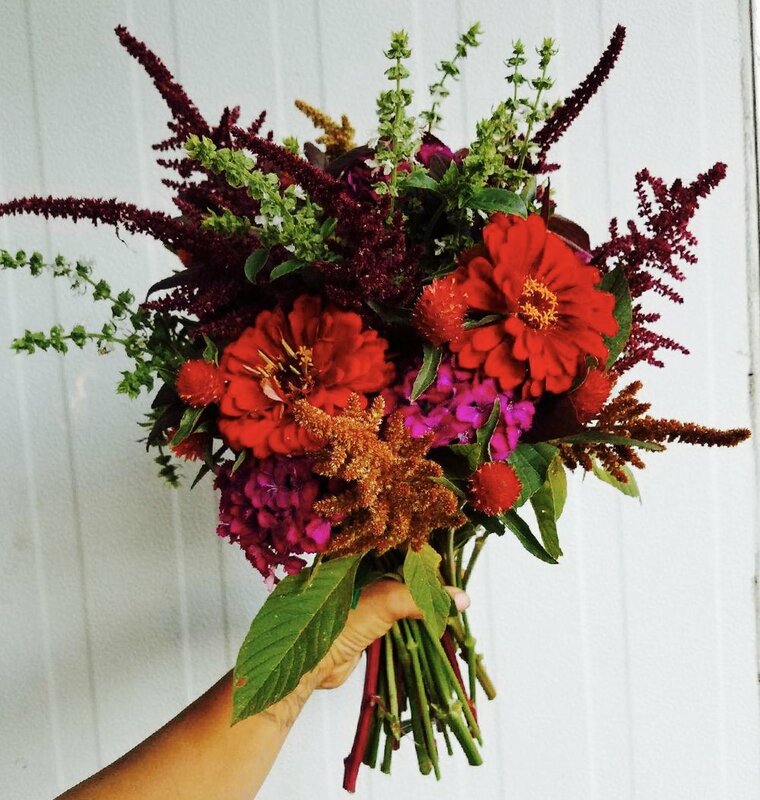 Some of the many flowers you may receive in a bouquet are snapdragons, zinnias, sunflowers, gladiolus, lilies, cosmos, marigolds, ageratum, dahlias, amaranth, and so much more! 1. You will receive a variety of organically grown fresh flowers from my farm each week at your preferred pickup location. The flowers will either be cut flowers grown on the farm or wildflowers foraged on the property. I am growing over 75 types of flowers, including tulips, alliums, snapdragons, zinnias, yarrow, rudbeckia, strawflowers, celosia, ageratum, larkspur, salvia, gladiolus and sunflowers -- to name just a few. 2. Since every season the spring warms up at a slightly different time, there is not a set begin and end date for the CSA. The full season CSA will go from mid April to October, partial season from mid June to October, and CSA sampler from August to the end of September. I will send out an email approximately one week before the CSA begins and another the week before it ends.